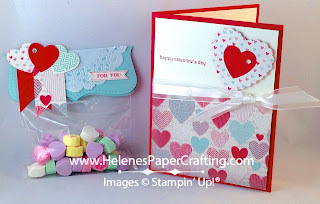 Here's a matching Valentine's Day treat bag and card I made with the Hearts a Flutter Bundle (that's the Hearts of Flutter stamp set and the Hearts a Flutter framelits). When you purchase a bundle, you save 15%. I love that! I used the More Amore Specialty Designer Series Paper with the coordinating Real Red, Very Vanilla, and Pool Party card stocks. To complete the project I add the Tea Lace Paper Doilies, a bit of bling and some ribbon. 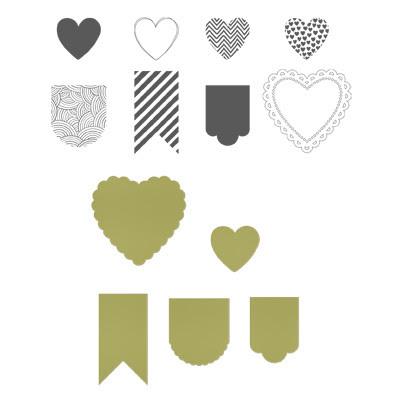 Here are all the stamps and coordinating framelits in the Hearts of Flutter Bundle. And, here are all the pretty patterns that come in the More Amore Speciality Designer Series Paper.